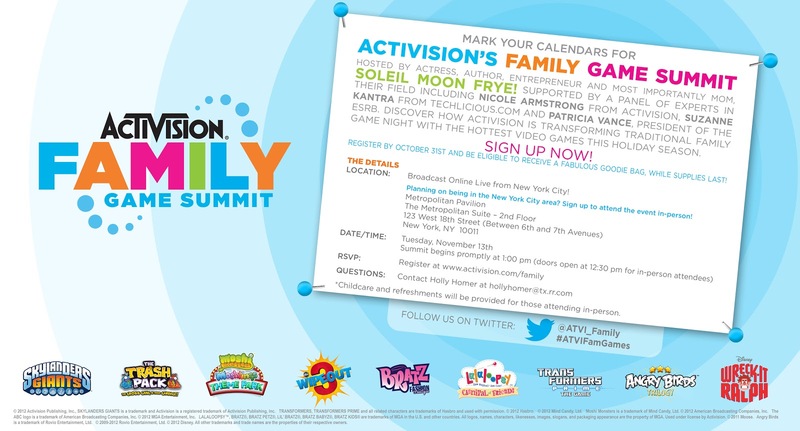 You are invited to register for the Activision's Family game summit where you can attend either online or in person in NYC. To Register for either the online Summit or to go in person please click here. She has some openings left to go in person. Also If you register before the 31st you have a better chance of getting a Goodie Bag worth about $200. This is happening on Tuesday November 13th at 1:00 PM. If you are attending in person you can be there at 12:30 PM. Childcare and refreshments will be provided for this event. After filling out the form you will be contacted with more details. I wish I could make it to this but since I can't I will be attending online. Those who attend online and qualify for the Goodie bag will have the bag mailed to them before the even so that they have it just like the attendees do on the day of the event. 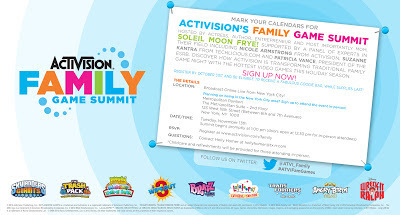 Soleil Moon Frye is the hostess and she will be joined by Experts including: Nicole Armstrong (Activision), Suzanne Kantra (Techlicious.com) and Patricia Vance (President of ESRB).